I am not entirely comfortable with putting personal info on there. Is it okay if for the name I just put my username? Also, for the birthday I also am not entirely comfortable with releasing that online as well (date is fine but year is a bit more worrysome, as I know many people with my b-day just not the same year). Sorry for being such a downer, but I know many people who have gotten hacked and don't really want to join that club. But besides that, the website looks great! So what do we want to do about a successor forum after COS is gone? So far, I know of no less than three forums already trying to become replacements. And finally, there's another one I've heard put forward, the-pensieve at Invision Board (I was never given a URL to this one). How do people want to consolidate these (and any others I may not be aware of)? Or perhaps we just pick one of these three as *the* successor and go with it? I just think it would be better for us COS people to continue on as one unified community instead of splintering off to these different places after this place closes. I've been part of forums that were forced to split before. It subtracts from the essence of what gives a place it's heart. I might suggest that whatever your most core group of supporters might lean towards, that would be the place to make a united replacement, give it a go and hope of the best. And know that it will never be the same, just something new. I was invited ot another forum. I registered but never entered to see what was available. Took me over a year before I had the nerve to register here. I would visit a lot. then when I got here, I thought I would never leave, but lately I haven't logged in much. Still visit from time to time. I'm not a member, but I've lurked. I can't load it with Firefox, but it seems to work in IE. That's strange... I've been able to load it fine with Firefox. Got Adblock Plus enabled on it, so I don't run into the odd pop up ad... but other than that, it loads ok.
Don't even try to load it on IE or on Google, since that stupid ad is still there . Is the site being blocked in someway? I love Firefox Every other site I go to works normally, except this one. Screenshots of the exact same link, so you can see what I see. That is weird. What version of Firefox do you have on your computer? I'm on a pretty recent one... version 20 or so iirc. It works ok there. Last edited by Fawkesfan1; July 9th, 2013 at 5:08 pm. I've within about a year met with two laptops who refuse to play properly with Firefox. It looks right but works horribly slow with a speed of about 15% of what ie or google chrom does on the same laptop with the same ADSL connection. The first one worked for a year but started this game last summer. The second one did it from the beginning. And the desktop works perfectly well with Firefox. Mysterious are the ways of the Gremlins. As for Google, that's what I generally use, with the exception of Arry's site. Can't get the smileys to load without having to deal with an evol pop up ad. Ad Block Plus seems to do its job too well on it . i wish that it only blocked the ads, and not everything else... I don't run into that issue on FF. It blocks only what it needs to block. It takes a little longer to start, but once it does, it works ok for the most part. Last edited by Fawkesfan1; July 9th, 2013 at 5:25 pm. When I registered (and I literally just registered) I used my goddess_clio email, used Clio as my first name, Goddess as my last name and made my username Godess_Clio. Worked fine. What I need to figure out now is how to go back and edit my personal information to make it less... personal. I don't care who knows my birthday but letting the internet know where I live to within a metropolitan area is a little too personal for my tastes; isn't disclosing my state specific enough? And trying to change it after you've registered is... a chore, it seems. I haven't figured out how to do it; the site wants me to give it a second password simply to edit my profile? What version of Firefox do you have on your computer? I'm on a pretty recent one... version 20 or so iirc. It works ok there. Me, too; I'm on Firefox 22.0 and the forum loads fine for me. I haven't explored really anything but the main page loads and at least two of the subforums and a couple threads that I checked out. I chose ArryGrotter's Hogsmeade only because it was most analogous to COS in its structure; I don't have to relearn where everything is, I more or less just have to remember about where it was here and go looking for it in a similar place. Also, it seems that from the limited looking around I've done at Hogsmeade.ucoz.com the people whose posts I enjoy most seem to be migrating there more than the other sites. So that's where I'll go. Thanks for the link! I tried several tips, with no luck. I think I'll try disabling some addons and see if that helps. Dang that's strange. You're welcome. Hopefully that'll work out. I do wonder if there will be a movement among the members to truly relocate after CoS closes. These forums seem empty even now (more so than before the announcement, in my view), and the alternative forums don't seem overly active, either. I wonder how many users are seeing the closing of CoS as a means to end a chapter of their lives - to wean themselves off of Harry Potter. And also, I know that, to many, the community of CoS is what made it so special, and perhaps many think it can't be duplicated (to which I'd agree, in many ways). However, I feel that that leaves those of us remaining in a bit of a corner. Where has everyone gone? Do you think we will be able to truly congregate somewhere after CoS? Is there a possibility of a future CoS "reunion"? I know that this thread serves to ponder these questions, but I don't know if we've come up with an inclusive answer yet. But that's the nature of the beast! These are all very valid questions to ponder over, and to be honest, I don't think they will be able to be answered until CoS is fully closed. But it is good to have these alternate forums become known while CoS is active, even when they are unlikely to become very active unlike after its closure, if at all. Good questions. It's hard to say, but I think we'll end up spread out. The Snape fans will regroup in one place, the Marauder fans somewhere else, and people who are more in the middle will either join a forum or get lost in the shuffle. This is all my own opinion. I think many here are putting off joining a forum until CoS actually closes. I've added as many friends as I can to my Facebook page, although there are some others I'd love to add as well and need to ask. It's the first time I'm seeing this thread. 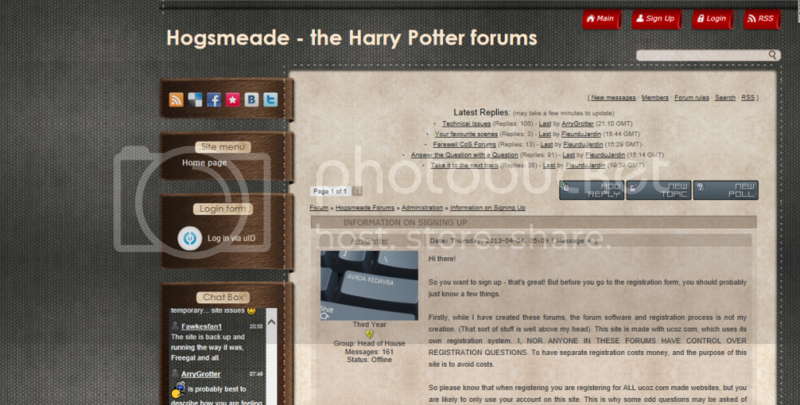 I've joined Arry's forum, and am glad he took the initiative to start it up. I'm still totally in denial, and I'm sort of hoping that CoS remains open. Even in a more streamlined form. I feel like if the costs of hosting were halved, and Matt was willing to let others take over, and if the current mods were willing to stay on... It would have a fighting chance. Otherwise, I will definitely be chiming into Arry's forum when CoS shuts down. I just finished reading HBP to my 9 year old, and she's brought up some really good questions and observations that after all this time hadn't occurred to me. HP is going to be in my life for quite some time still, so clearly I'm not ready to 'move on' as they say. I believe that people will definitely drift away, which is inevitable with such a large community as COS, and there are undoubtedly members who have long since moved on from COSforums and become, for all intents and purposes, inactive. As for other forums, I agree with several other members that ArryGrotter's forum's definitely the one I'll be going to after this forum closes.